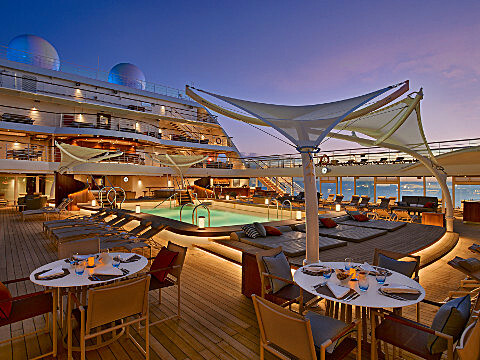 Seabourn has officially debuted the strikingly beautiful and excitingly innovative new Seabourn Encore. It crowns a fleet that is already the newest, most modern and most acclaimed in the ultra-luxury segment. Seabourn Encore represents another welcome stage in the evolution of small-ship cruising, which Seabourn pioneered and has consistently expanded and enriched. It delivers a fresh vision and a host of illuminating ideas to delight the world’s most discerning travelers. To further advance its mission with Seabourn Encore, Seabourn enlisted the participation of master designer Adam D. Tihany. 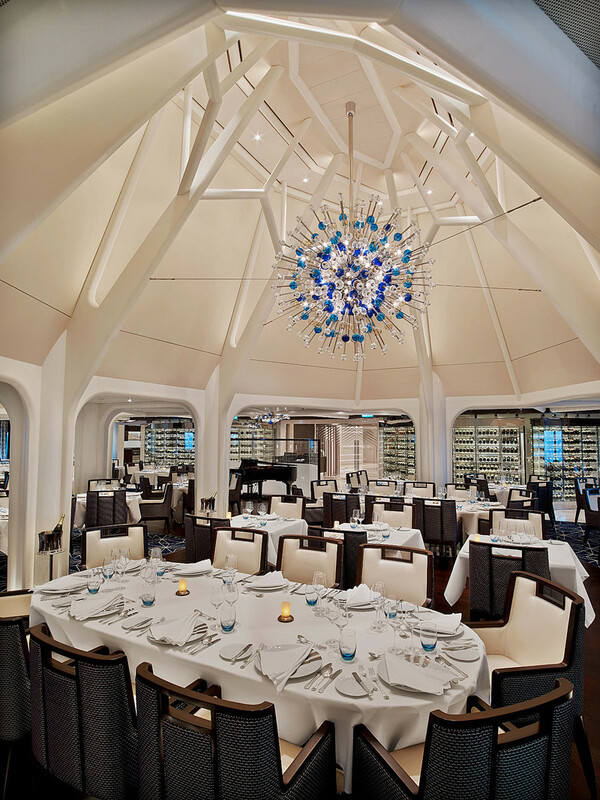 Although the architecture of Seabourn Encore is not radically different from Seabourn’s other three ships, Tihany’s vision is present throughout the ship. There is a new softness and a curvaceous elegance to his designs that reflect a noticeably bespoke aesthetic. The vessel exudes ultra-luxury with design elements often found in private yachts. Nautical visual elements are employed with an exceptional intelligence and sophistication. And, true to his vision, Tihany has enriched the entire ship with an impressive array of unexpected surprises and subtle transformations for guests to continually discover and delight in --- but those, as he so wisely says, are not meant to be described, but rather to be discovered. 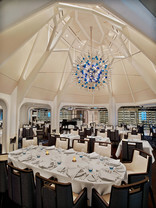 Seabourn Conversations: The art of conversation has always been central to the Seabourn experience. Our voyages attract interesting, interested people –people who enjoy talking together, sharing their interests, their adventures and discoveries, and their life stories with longtime and newfound friends. Their enthusiasms and curiosity are far-ranging, and these are what spark their desire to travel the world. Daring explorers, heralded chefs, learned scholars, celebrated performers and renowned experts from every arena of the arts, sciences, politics and the humanities share your journey on our intimate ships. They each bring skilled presentations of their expertise for guests to enjoy. But just as importantly, they participate in the daily social scene, sharing meals, adventures ashore and casual chats throughout the voyage. On some ships, they lecture. 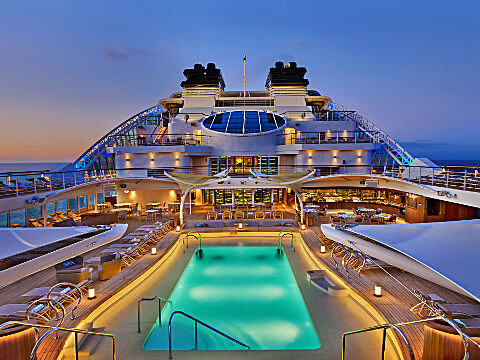 On Seabourn, they join the conversation. Shopping with the Chef — at local food markets. Wherever you are in the world, you’ll enjoy an insider’s look at unique regional markets with an expert Seabourn chef as your guide. 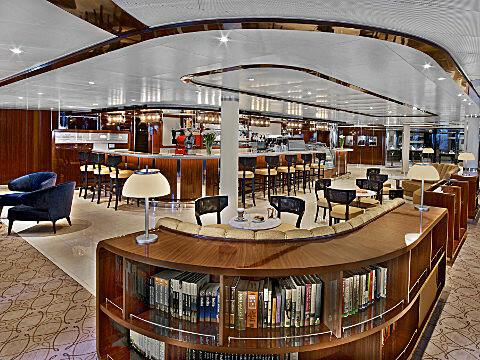 Seabourn Square: Seabourn’s innovative “living room” replaces the conventional reception lobby with a welcoming lounge filled with comfortable sofas, easy chairs and cocktail tables. Spa & Wellness with Dr. Andrew Weil: Seabourn is pleased to announce in partnership with The Onboard Spa by Steiner, we have created a fleet-wide mindful living program offering guests a holistic spa and wellness experience that integrates physical, social, environmental and spiritual well-being. The new Spa and Wellness with Dr. Andrew Weil program will be the first-ever of its kind at sea. Fitness Center: features high performance Technogym equipment for cardio and strength training. We also offer a series of complimentary classes including yoga, Pilates and Tai Chi. Or, if personal attention is preferred, our personal trainers will design a nutrition and exercise plan that will help you achieve results. Based on your body’s particular needs, this personalized session will expose you to the wellness program that works best with your body. The Collection: Three duty-free shops, The Seabourn Shop features shield-emblazoned logo wear. The Boutique offers fashions, cosmetics, scents and designers’ luxury goods. The Collection is a curated selection of fine watches and jewelry including a private showroom for diamonds and other gemstones. The Retreat: A tranquil setting housed in a distinctive flower-shaped canopy that shields guests from sun and wind, The Retreat is ringed with 15 private cabanas designed as individual luxury living rooms that each feature a large HD flat screen television and a refrigerator stocked with a personalized selection of beverages. The Retreat is located around a central whirlpool. 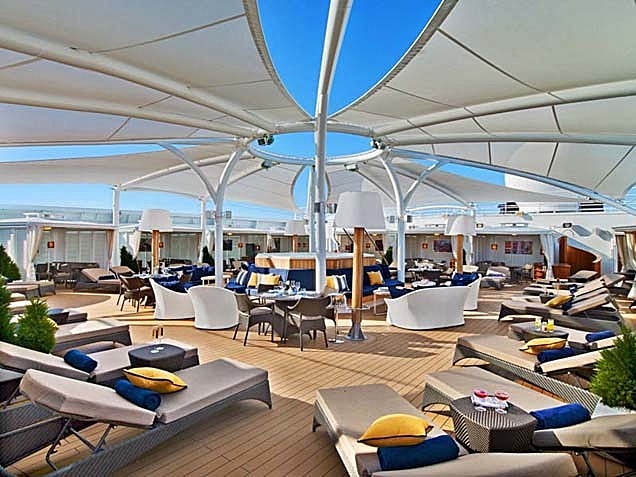 Up to 28 guests can stretch out on comfortable sun loungers; pull up a bar stool or take a table seat for champagne and cocktails custom created by Seabourn mixologists; or enjoy a selection of bites from a healthy spa menu. A selection of amenities include fresh fruit baskets, premium sun lotions, Evian mist spray, plush towels and personalized bathrobes, while a dedicated Retreat Concierge will be available to satisfy guest requests. Some of life's most cherished moments occur around the table, and every meal with Seabourn is another opportunity to celebrate. Seabourn’s award-winning cuisine starts with the finest quality ingredients, infused with authentic regional flavors, prepared á la minute by our skilled chefs and served with pride. The Grill: Inspired by the classic American chophouse, The Grill focuses on updated versions of iconic dishes. Guests setting foot inside the elegant dining room will be treated to table-side preparations of Caesar salad and ice cream sundaes as well as a range of other steakhouse favorites like Lobster Thermidor and creamed spinach, presented a la carte. The timeless menu will draw on the freshest products from artisan purveyors. A cocktail program and wine list of domestic and old world labels complement the menu. Sushi: Seabourn Encore features for the first time ever a dedicated sushi restaurant on board a Seabourn ship Seabourn researched the best ingredients and developed a menu that is a perfect blend of authenticity to maintain the root of the cuisine, and a twist of Seabourn’s culinary expertise. The sushi concept is a modern line that is steeped in tradition using the finest ingredients. Hamachi, tuna, shrimp and other fresh fish products will be shipped from Japan to Sushi and served a la carte for dinner. The menu features caviar and small plates, along with a selection of maki rolls, sushi and sashimi, and salads. In addition, the restaurant will feature three varieties of Bento boxes for lunch: meat, seafood and vegetarian. The Colonnade: A more casual alternative with indoor/outdoor seating, sumptuous buffets and daily specials for breakfast and lunch. The Colonnade serves regionally-themed, bistro-style dinners with table service nightly. The Patio: Casual poolside dining featuring grilled specialties, salads and sides for lunch and dinner, and freshly baked pizzas throughout the afternoon. Lunches and dinners are offered at the Sky Grill, serving grilled specialties and simple sides. Movies Under the StarsSM: Watch the stars, both on the big screen and twinkling overhead, as you snuggle up for a Hollywood classic or a big hit on the pool deck. Evening Under the StarsSM: Dancing anywhere is fun, but dancing outdoors under the stars is something entirely different. 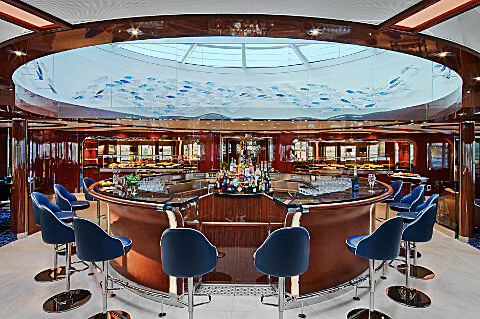 Observation Bar: A stunning round lounge with a square bar and panoramic views. Early Risers’ Coffee and Tea is served here every morning, and piano music makes it a great choice for drinks and conversation before and after dinner. Sky Bar & The Patio Bar for outdoor cocktails. The Patio Bar is open even if it is a bit chilly outside, crew members carefully wrap passengers in blankets, if needed. Grand Salon: The ship’s main showroom can accommodate all guests, though it seldom does because of the variety available. Lectures, cooking demonstrations, movies and other gatherings are held here in the daytime. In the evenings, live music for dancing before dinner gives way to vocal production shows, cabaret performances, comedy, and classical recitals, as well as more dancing later. Casino is located on deck 5. The Club: bring your dancing shoes and show off your moves and enjoy the live band.